Eligibility: Open only to legal residents of the fifty (50) United States (including District of Columbia) who are at least eighteen (18) years old. Entry Dates: Begins on April 7, 2010 at 12:00 a.m. Eastern Time and ends on October 31, 2010 at 11:59 p.m. ET. Spring Entry Period: Starts at 12:00 a.m. ET on 4/7/10 and ends at 11:59 p.m. ET on 5/31/10. Summer Entry Period: Starts at 12:00 a.m. ET on 6/1/10 and ends at 11:59 p.m. ET on 8/31/10. Fall Entry Period: Starts at 12:00 a.m. ET on 9/1/10 and ends at 11:59 p.m. ET on 10/31/10. How to Enter: Visit www.scottsinsider.com and complete and submit the online entry form. Entry Limits: Each participant may register/login, and click on the “Weekly Tip” link one (1) time per day, and tell up to three (3) friends per day. 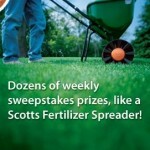 Ten (10) entries for being registered to receive the Scotts Lawn Care Reminders, signing up to receive Scotts Lawn Care Reminders (if not already signed up), or clicking on the alternate method of entry link. Ten (10) additional entries per friend into the Seasonal Entry Period drawing corresponding to the date when his/her friend signs up to receive the Scotts Lawn Care Reminders. Five (5) additional entries per week by participating in polling and five (5) additional entries per question answered for participating in an online survey. (1) SPRING GRAND PRIZE: A Poulan 19.5 HP Riding Lawn Tractor. Approximate Retail Value: $2,000. (1) SUMMER GRAND PRIZE: A Darlee Outdoor Dining Set. ARV: $2,000. (1) FALL GRAND PRIZE: A Weber Summit S-650 LP Gas Grill. ARV: $2,000. (1) FIRST PRIZE: Scott’s Deluxe Reel Lawn Mower. ARV: $100. (1) SECOND PRIZE: Self Winding Hose Reel. ARV: $80. (1) THIRD PRIZE: Traveling Sprinkler. ARV: $60. (1) FOURTH PRIZE: Pop-Up Garden Bag. ARV: $40. (1) FIFTH PRIZE: Coil Hose. ARV: $40. (1) SIXTH PRIZE: Bocce Ball Set. ARV: $40. (70) SEVENTH PRIZES: $15 Home Depot gift card (terms and conditions apply). ARV: $15. (104) EIGHTH PRIZES: $10 Wal-Mart gift card (terms and conditions apply). ARV: $10. Prize Limit: One (1) Seasonal Prize, one (1) Weekly Prize and one (1) Instant Game Prize per person. Spring Drawing: On or about 6/3/10. Summer Drawing: On or about 9/2/10. Fall Drawing: On or about 11/2/10. Been playing this everyday with no luck, but finally won the $15 Home Depot gift card! i just won a $10 Wal-mart gift card, after many days of playing! about 9:25 am EST Sunday.